This establishment, which is promoted by a Joint Stock Company (The Strand Musick Hall Company) after numerous delays, opens to the public to-morrow, though probably it will never have a more crowded or attentive audience than at its inauguration last evening. Continental Gothic is the basis of this eclectic design, and if the architect has succeeded in erecting a structure which, departing from recognised codes, outrages none, he trusts that unity and comprehensiveness in the execution of a difficult task will obtain for him a just appreciation of his work. 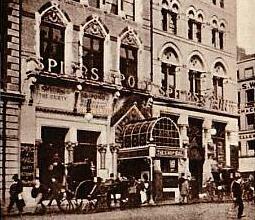 Right - The Strand Musick Hall and old Gaiety Theatre frontage. The main building as it at present exists, which constitutes what may be called the Hall proper, covers ground running E. and W. from opposite the Lyceum Theatre, in Wellington Street, Strand, to Catherine Street, where it has a present frontage of seventy feet, from which to Wellington Street the depth is over a hundred and ten feet. The Company have acquired the land upon which will ultimately extend the main building to Exeter Street on the N., where it will possess a frontage of about sixty feet. The Hall is approached from the Strand by a building ninety-six feet long, with a frontage of thirty-six feet to the Strand, which contains besides the spacious corridors and grand staircase saloon (forming communications from the Strand with all parts of the building), commodious and elegant dining and smoking rooms, with waiters' serving rooms, and lavatory and dressing rooms for visitors to each; and immediately communicating with the Hall proper on the ground, balcony, and box floors, refreshment bars or buffets, which will be used as luncheon bars and for the service of the dining-rooms during the day, and as buffets for the use of the Hall in the evening. 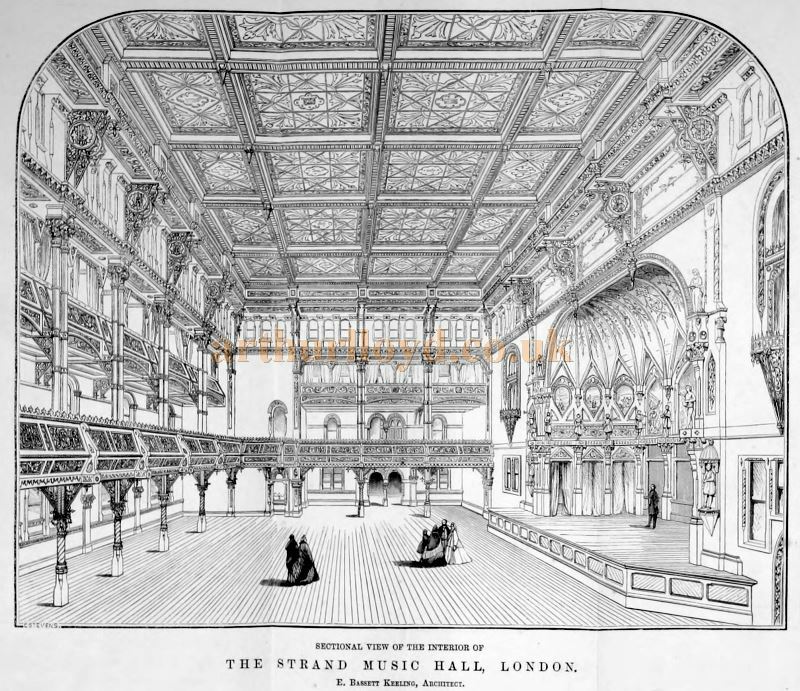 Above - The Strand Musick Hall interior in 1864. From 'The Lost Theatres Of London' Raymond Mander and Joe Mitchenson 1975. The building has been erected from the designs and details of Mr. E. Bassett Keeling, of Gray's Inn, and under the superintendence of himself and Mr. H. H. Collins, the joint architects to the Company. The whole of the coloured decorations, which are of~ a very novel and elaborate character, have been executed from the special directions of Mr. Keeling, under whose independent control the whole of the decorative portions of the building have been carried out. Among those connected with the building we may mention that the general contractors were Messrs. Trollope and Sons. The whole of the gas arrangements have been executed by M~ssrs. Defries and Sons. The ventilating apparatus, lifts, etc have been under the care of Mr. Wilson W. Phipson C.E. All ornamental wrought iron work in the front building is by Hart and Sons, and the copper folia tions are by Brawn, of Birmingham. The painting and decorations have been executed by Mr. Geo Foxley, and the greater portion of the stone carving has been undertaken by Mr. Tolmie. The ventilation of the whole structure has received the greatest attention at the hands of Mr. Wilson W. Phipson, and it is hoped that a degree of success has been secured which will render the Strand Musick Hall the best ventilated public building in London. Vocal and Instrumental Operatic Selections will fill a prominent place in the nightly programmes, and will be arranged upon a novel plan, calculated to afford full scope at once for the talent of the singers and for the skill of the orchestral performers. The symphonies of the Great Masters will occasionally be rendered, but at the same time the light and effervescent works of the composers of the hour will receive their full share of attention. The aim of the Directors of the Strand Musick Hall will be to please all tastes, save only those which are depraved. They purpose to enable the classical amateur to revel in the emanations of the loftiest genius - the lover of sparkling dance music to drink in the capering melodies to his heart's content - the worshipper of grand lyric inspirations to depart well satisfied with his treat - the adorer of the simple ballad to feel that he has had his full share of enjoyment - and the patron of comic singing to recognise that his special predilections have not been uncared for. In the last- named department it may be almost needless to say that every feature introduced will be jealously and rigorously scrutinised, and carefully kept free from anything that could shock the most refined taste or grate upon the most delicate susceptibilities. Smoking and drinking have, in the establishments heretofore called Music Halls, sat elbow to elbow - with harmony. The Directors of the Strand Musick Hall have thought it fitting to bestow this designation upon their building, inasmuch as it is a Hall devoted to the performance of music - but as the music given will be of a superior class, they expect from their visitors an equally exalted etiquette. Creature corn- forts - both nicotian and alcoholic - will be found at the spacious buffets, and in the corridors and saloons which surround the Hall. Visitors will have all the facilities they could desire for their puflings and their potations, but not within the Hall, which I is consecrated to music. The novel system invented and patented by Messrs. J. Defies and Sons, who have had the entire management of everything concerning the lighting of the building, will form one of the prominent features of - the Hall, and cannot fail to create a total innovation in the system hitherto adopted in lighting Theatres, Concert-rooms, and other large buildings. This new system combines that great desideratum of allying with the nearest approach to a soft daylight a system - of thorough and complete ventilation throughout the building. Hence to Messrs. J. Defries and Sons is due the full credit of having overcome those difficulties which had hitherto arisen in lighting, and the same time introducing a proper system of ventilation; and their patent is destined to form a new era in the principle of lighting. The numerous audiences which will no doubt visit this new resort of amusement will fully appreciate the beautiful amalgamation of colours produced without there being any show of gas. The light is entirely given from the top of the building, and by a combination of coloured sheets of glass and prisms, a soft and radiant light is thrown into every part of the building. The system of ventilation is so perfect, that a continual current of fresh air is introduced throughout the building, whilst the impure air, as well as the heat, is carried away through the top of the building by the powerful current which is established. The Era, 16 October 1864. This large, elegant, and central Theatre, has been erected on part of the Strand, part of Exeter Street, part of Catherine Street, and part of Wellington Street, and the site of the Strand Musick Hall - a building that has been entirely pulled down for the lobbies of the new house. The site possesses the very marked advantage of approach from the four main thoroughfares before named, and occupies a much larger area than any similar property situated on that great stream of through traffic - the Strand. A portion of the Strand frontage, lately known as that of the Strand Musick Hall, remains almost as formerly; a few modifications, however, have necessarily been made on the ground storey by the erection of the new entrance, which will form the approach to the principal tiers of the Theatre. The rooms over this entrance, and the new building extending along the Strand, forming the angle of Catherine Street will form the Restaurant' entirely distinct from the Theatre, but with a corridor of access from every tier of the Theatre. As mentioned above, the principal entrance is in the Strand, leading by a few steps to the level of the stalls, and by a spacious octangular staircase to the balcony or grand tier and the upper boxes. Another entrance, also on this level, is in Exeter Street, on the other side of the stalls, which, though designed specially as a private entrance for the Royal Family, is available as an exit-way in case of sudden panic, there being a stone staircase from the entrance to the highest floor of the Theatre, with communication on every level. There is also a corridor running under the back of the pit, solely for the use of the stalls' audience, thus giving access on both sides of the house, and obviating the unpleasantness of having to cross the audience when the performance has commenced. The entrances to pit and gallery are in Catherine Street, and the stage entrance is in Wellington Street. The plan of the auditory is quite new to London. It consists of a balcony, the front forming a semicircle, opening out by arms of a contrary flexure to the proscenium column; behind this is a tier of private boxes, with the restu of which the front of the upper boxes radiates; and a gallery above, the front of which form a complete circle. The columns supporting the various tiers are carried up to a sufficient height above the gallery, and from the cap spring a series of arches supporting an elaborate cornice and coved ceiling. 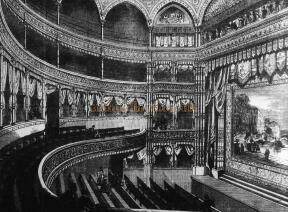 Right - Old Gaiety Theatre Interior 1868 - From 'The Lost Theatres Of London' Raymond Mander and Joe Mitchenson - Click for last night programme. The proscenium pillars are all of solid stone, enriched with carved capitals. There are five rows of arm-chairs in stalls; a commodious pit; three rows of arm-chair stalls in balcony; four rows of upper box seats, with considerable standing room; twenty-eight private boxes; and a spacious gallery. In all, the capacity of this house is above the average of the London Theatres, and will hold upwards of 2,000 persons. Every department or division of the audience has its own approach separate from the others; and all the tiers have enclosed corridors at back; one special feature of the arrangements being that there are staircases on both sides of the dress circle, upper boxes, and gallery, with external doors at the bottom of each, and all fireproof. In fact, the whole construction of the building is as nearly as possible fireproof, for not only are all staircases, passages, and corridors of stone or cement, and separated in every case by brick walls, but the several tiers - balcony, upper boxes, and gallery - have no wood in their construction, except the flooring boards; they are entirely built of an iron framework, embedded in and filled between with a solid mass of cement con- crete, much on the principle adopted at the Grand Opera and the New Vaudeville Theatre at Paris, which system was adopted there as being the most perfect that could be devised, as by diminishing the amount of inflammable material in a building the risk of its even taking fire is rendered almost impossible, while the prevention of a fire spreading is insured. With the exception of the two Theatres at Paris before mentioned, the Gaiety' will be the only Theatre in Europe so constructed. The ironwork necessary for this construction has been manufactured by Messrs. W. and T. Phillips of the Coal Exchange, at their works in Belgium, and constructed by them at the Theatre, in a very satisfactory manner. The very elaborate box-fronts, together with the arches and cornices, are executed in patent plaster on canvas, and manufactured and fixed by the patentees, Messrs. George Jackson and Sons, of Rathbone Place, from the architect's designs. The iron balcony-front was executed by Messrs. Hart, of Wych Street. Right - Whych Street in 1901 - Click to enlarge. The lighting of the auditory is by a powerful sunburner, which will act as an efficient ventilator, manufactured by Messrs. Strode and Co., who have also executed the float-lights. These are of peculiar as well as novel construction, and have only been used before in England at the Queen's Theatre and at Brighton, by the same architect. In the present instance, many modifications have been introduced. The float consists of a series of argand burners reversed, and burning downwards, the products of the combustion being taken away in a large iron cylinder running parallel with the front of the, stage, and carried up inside the brickwork behind the proscenium columns. One great advantage gained by this invention is, that the unpleasant vapour screen, which in the old manner was constantly rising between the audience and the scene, is entirely removed, and the performers can now approach the foot-lights without the risk of getting burnt, as a piece of gauze may be placed over the burner without ignition. By an ingenious contrivance, should any of the glasses break, that particular burner falls down and shuts off the gas. The coloured glasses, called mediums, are worked on levers in front of the lights, on the same principle as the switch-lights on railways. The stage has been constructed by Mr. G. R. Tasker, the Clerk of Works, and is a most elaborate piece of mechanism, admirably contrived and executed, fitted up with several novelties in the way of machinery. There is a depth of some twenty feet under the stage floor, for sinking large scenes, and a height above of fifty feet. All the departments of the stage are very complete. There are green-rooms, managers' rooms, and more than twenty other rooms, for the numerous requirements of a large dramatic company, with wardrobes, propertyrooms, carpenters' shops, etc. The whole of the coloured decoration of the auditory and the lobbies has been executed by Mr. George Gordon, late of the Bristol and Bath Theatres. It partakes somewhat of the early Romanesque character, thus carrying out the architecture of the house with some of the most beautiful- and varied of the Greek forms of ornament introduced. The same gentleman has also painted the act drop, which, unlike that at most Theatres, is intended not as a scene or a picture, but as a part of the decoration of the Theatre. The design is extremely chaste and elegant; and the small vignette in the centre, representing a villa on one of the Italian lakes, is broadly, and at the same time delicately painted. Perhaps the most noticeable feature of the decoration is the frieze over the proscenium, designed and painted by Mr. H. S. Marks - 30 feet long by 4 feet 6 inches deep. It represents a king and queen of mediaeval times, with surrounding courtiers, watching a masque whicji is being performed before them. On either side this frieze, over the proscenium boxes, are lunettes in the arches - the one on the left represents lyric, and the other epic poetry - designed by the same artist. It is satisfactory to find that these pictures, which are really fine works of art, have been painted by Mr. Marks in no narrow spirit as easel pictures, but as forming a part of, and in a measure subservient to, the general scheme of decoration. The arm-chairs in stalls and balcony are those designed by the architect, and manufactured by Wadman Brothers, Bath. The chairs for private boxes were made by Mr. Church, of Bath. The curtains have been supplied by Messrs. Hampton, of Pall Mall, and the carpets by Messrs. Tyler, of Long Acre. The general builder's work has been done by Mr. Simpson; and the gas work (except as mentioned above) by Messrs. J. Jones and Son, of Bow Street. The Gaiety Theatre, which is to be under the Lesseeship and Management of Mr. John Hollingshead, will be opened on the evening of Monday, the 21st inst. All box, booking, and other fees will, with the necessary assistance of the public, be thoroughly abolished, and the performances will always conclude at a reasonable hour. Among the members of the dramatic company are Mr. Alfred Wigan, M. Stuart (from the Odeon and Guile, Paris), Miss Madge Robertson, and Miss E. Farren. Mr. Robert Soutar will be Stage-Manager. The ballet will be principally selected from the Royal Italian Opera, and Mdlle. Bossi (from the Porte St. Martin) will be premiere danseuse. The entertainments on the opening night will consist of an operetta, entitled The Two Harlequins; a comedy from the French, called On the Cards; and an operatic extravaganza, by Mr. Gilbert named Robert le Diable. The orchestra will be under the direction of M. Kettenus, of Her Majesty's Opera. Above text from the Era, 13 December, 1868.